Tetã Hetãvoregua VolíviaInvalid language code. Bolivia ( /bəˈlɪviə/; Spanish: [boˈliβja]; Guarani: Mborivia [ᵐboˈɾiʋja]; Script error [bʊlɪwja]; Template:Lang-ay [wʊlɪwja]), officially known as the Plurinational State of Bolivia (Spanish: Estado Plurinacional de Bolivia), is a landlocked country located in western-central South America. 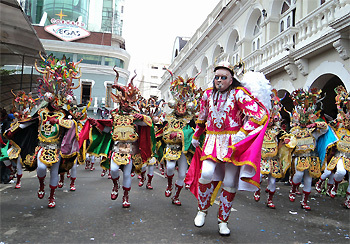 The capital is Sucre while the seat of government is located in La Paz. The largest city and principal economic and financial center is Santa Cruz de la Sierra, located on the Llanos Orientales (tropical lowlands) a mostly flat region in the east of Bolivia. It is constitutionally a unitary state, divided into nine departments. Its geography varies from the peaks of the Andes in the West, to the Eastern Lowlands, situated within the Amazon Basin. It is bordered to the north and east by Brazil, to the southeast by Paraguay, to the south by Argentina, to the southwest by Chile, and to the northwest by Peru. One-third of the country is within the Andean mountain range. With 1,098,581 km2 (424,164 sq mi) of area, Bolivia is the 5th largest country in South America and the 27th largest in the world. Before Spanish colonization, the Andean region of Bolivia was part of the Inca Empire, while the northern and eastern lowlands were inhabited by independent tribes. Spanish conquistadors arriving from Cuzco and Asunción took control of the region in the 16th century. During the Spanish colonial period Bolivia was administered by the Royal Audiencia of Charcas. Spain built its empire in great part upon the silver that was extracted from Bolivia's mines. After the first call for independence in 1809, 16 years of war followed before the establishment of the Republic, named for Simón Bolívar. Over the course of the 19th and early 20th century Bolivia lost control of several peripheral territories to neighboring countries including the seizure of its coastline by Chile in 1879. Bolivia remained relatively politically stable until 1971, when Hugo Banzer led a coup d'état which replaced the unstable government of Juan José Torres with a military dictatorship headed by Banzer; Torres was murdered in Buenos Aires, Argentina by a right-wing death squad in 1976. Banzer's presidency oversaw rapid economic growth which stabilized the country, while his regime cracked down on leftist and socialist opposition and other forms of dissent, resulting in the torture and deaths of a number of Bolivian citizens. Banzer was ousted in 1978 and later returned as the democratically elected president of Bolivia from 1997 to 2001. 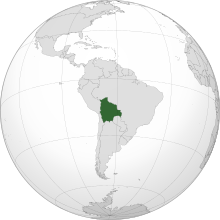 Modern Bolivia is a charter member of the UN, IMF, NAM, OAS, ACTO, Bank of the South, ALBA and USAN. For over a decade Bolivia has had one of the fastest economic growths in Latin America, however it remains one of the poorest countries in South America. It is a developing country, with a medium ranking in the Human Development Index, a poverty level of 38.6 percent, and it has one of the lowest crime rates in Latin America. Its main economic activities include agriculture, forestry, fishing, mining, and manufacturing goods such as textiles, clothing, refined metals, and refined petroleum. Bolivia is very rich in minerals, especially tin. Tiwanaku's elites gained their status through the surplus food they controlled, collected from outlying regions and then redistributed to the general populace. Further, this elite's control of llama herds became a powerful control mechanism as llamas were essential for carrying goods between the civic centre and the periphery. These herds also came to symbolize class distinctions between the commoners and the elites. Through this control and manipulation of surplus resources, the elite's power continued to grow until about AD 950. At this time a dramatic shift in climate occurred, causing a significant drop in precipitation in the Titicaca Basin, believed by archaeologists to have been on the scale of a major drought. Bolivia was captured and recaptured many times during the war by the royalists and patriots. Buenos Aires sent three military campaigns, all of which were defeated, and eventually limited itself to protecting the national borders at Salta. Bolivia was finally freed of Royalist dominion by Antonio José de Sucre, with a military campaign coming from the North in support of the campaign of Simón Bolívar. After 16 years of war the Republic was proclaimed on 6 August 1825. Following the renewed independence of Peru, Peruvian president General Agustín Gamarra invaded Bolivia. The Peruvian army was decisively defeated at the Battle of Ingavi on 20 November 1841 where Gamarra was killed. The Bolivian army under General José Ballivián then mounted a counter-offensive, capturing the Peruvian port of Arica. Later, both sides signed a peace treaty in 1842, putting a final end to the war. During the early 20th century, tin replaced silver as the country's most important source of wealth. A succession of governments controlled by the economic and social elite followed laissez-faire capitalist policies through the first thirty years of the 20th century. 12 years of tumultuous rule left the MNR divided. In 1964, a military junta overthrew President Estenssoro at the outset of his third term. The 1969 death of President René Barrientos Ortuño, a former member of the junta who was elected president in 1966, led to a succession of weak governments. Alarmed by the rising Popular Assembly and the increase in the popularity of President Juan José Torres, the military, the MNR, and others installed Colonel (later General) Hugo Banzer Suárez as president in 1971. He returned to the presidency in 1997 through 2001. Gonzalo Sánchez de Lozada pursued an aggressive economic and social reform agenda. The most dramatic reform was the "capitalization" program, under which investors, typically foreign, acquired 50% ownership and management control of public enterprises in return for agreed upon capital investments. The Law of Popular Participation gave municipalities the responsibility of maintaining various infrastructures (and offering services): health, education, systems of irrigation, which stripped the responsibility away from the state. The reforms and economic restructuring were strongly opposed by certain segments of society, which instigated frequent and sometimes violent protests, particularly in La Paz and the Chapare coca-growing region, from 1994 through 1996. During this time, the umbrella labor-organization of Bolivia, the Central Obrera Boliviana (COB), became increasingly unable to effectively challenge government policy. A teachers' strike in 1995 was defeated because the COB could not marshal the support of many of its members, including construction and factory workers. In the June 2002 national elections, former President Gonzalo Sánchez de Lozada (MNR) placed first with 22.5% of the vote, followed by coca-advocate and native peasant-leader Evo Morales (Movement Toward Socialism, MAS) with 20.9%. A July agreement between the MNR and the fourth-place MIR, which had again been led in the election by former President Jaime Paz Zamora, virtually ensured the election of Sánchez de Lozada in the congressional run-off, and on 6 August he was sworn in for the second time. The MNR platform featured three overarching objectives: economic reactivation (and job creation), anti-corruption, and social inclusion. The indigenous population of the Andean region was not able to benefit from government reforms. Llanos. A humid tropical climate with an average temperature of 30 °C (86 °F). The wind coming from the Amazon rainforest causes significant rainfall. In May, there is low precipitation because of dry winds, and most days have clear skies. Even so, winds from the south, called surazos, can bring cooler temperatures lasting several days. Chaco. Subtropical semi-arid climate. Rainy and humid in January and the rest of the year, with warm days and cool nights. Bolivia's variable altitudes, ranging from 90–6542 metres (300–21,463 ft) above sea level, allow for a vast biologic diversity. The territory of Bolivia comprises four types of biomes, 32 ecological regions, and 199 ecosystems. Within this geographic area there are several natural parks and reserves such as the Noel Kempff Mercado National Park, the Madidi National Park, the Tunari National Park, the Eduardo Avaroa Andean Fauna National Reserve, and the Kaa-Iya del Gran Chaco National Park and Integrated Management Natural Area, among others. Bolivia has more than 2,900 animal species, including 398 mammals, over 1,400 birds (about 14% of birds known in the world, being the sixth most diverse country in terms of bird species), 204 amphibians, 277 reptiles, and 635 fish, all fresh water fish as Bolivia is a landlocked country. In addition, there are more than 3,000 types of butterfly, and more than 60 domestic animals. There are 53 prisons in Bolivia, which incarcerate around 8,700 people as of 2010. The prisons are managed by the Penitentiary Regime Directorate (Spanish: Dirección de Régimen Penintenciario). There are 17 prisons in departmental capital cities and 36 provincial prisons. for a period of 99 years starting in 1992; once that time has passed, all the construction and territory revert to the Peruvian government. Since 1964, Bolivia has had its own port facilities in the Bolivian Free Port in Rosario, Argentina. This port is located on the Paraná River, which is directly connected to the Atlantic Ocean. The Bolivian military comprises three branches: Ejército (Army), Naval (Navy) and Fuerza Aérea (Air Force). The legal age for voluntary admissions is 18; however, when the numbers are small the government recruits anyone as young as 14. The tour of duty is generally 12 months. The Bolivian government annually spends $130 million on defense. The Bolivian army has around 31,500 men. There are six military regions (regiones militares—RMs) in the army. The army is organized into ten divisions. Though it is landlocked Bolivia keeps a navy. The Bolivian Naval Force (Fuerza Naval Boliviana in Spanish) is a naval force about 5,000 strong in 2008. The Bolivian Air Force ('Fuerza Aérea Boliviana' or 'FAB') has nine air bases, located at La Paz, Cochabamba, Santa Cruz, Puerto Suárez, Tarija, Villamontes, Cobija, Riberalta, and Roboré. Bolivia's estimated 2012 gross domestic product (GDP) totaled $27.43 billion at official exchange rate and $56.14 billion at purchasing power parity. Economic growth was estimated to be at about 5.2%, and inflation was estimated at about 6.9%. Bolivia was rated "Repressed" by The Heritage Foundation's 2010 Index of Economic Freedom. Despite a series of mostly political setbacks, between 2006 and 2009 the Morales administration has spurred growth higher than at any point in the preceding 30 years. The growth was accompanied by a moderate decrease in inequality. A surplus budget of 1.7% (GDP) was obtained by 2012, the government runs surpluses since Morales administration reflecting a prudent economic management. Bolivia owns a communications satellite which was offshored/outsourced and launched by China named Túpac Katari 1. In 2015, it was announced that electrical power advancements include a planned $300 million nuclear reactor developed by the Russian nuclear company Rosatom. Two concessions to foreign private companies in two of the three largest cities – Cochabamba and La Paz/El Alto — were prematurely ended in 2000 and 2006 respectively. The country's second largest city, Santa Cruz de la Sierra, relatively successfully manages its own water and sanitation system by way of cooperatives. The government of Evo Morales intends to strengthen citizen participation within the sector. Increasing coverage requires a substantial increase of investment financing. The ethnic composition of Bolivia is diverse, and racial classifications, though outdated, are abundant. The vast majority of Bolivians are mestizo (with the indigeneous component higher than the European one), altough the government has not included culltural self-identification “mestizo” in the November 2012 census. There are approximately three dozen native groups totaling approximately half of the Bolivian population – the largest proportion of indigenous people in Latin America. Exact numbers vary based on the wording of the ethnicity question and the available response choices. For example, the 2001 census did not provide the racial category "mestizo" as a response choice, resulting in a much higher proportion of respondents identifying themselves as belonging to one of the available indigenous ethnicity choices. Mestizos are distributed throughout the entire country and make up 26% of the Bolivian population. Most people assume their mestizo identity while at the same time identifying themselves with one or more indigenous cultures. A 2009 estimate of racial classification put mestizo (mixed white and Amerindian) at 15-20%, indigenous at 70-75%, white at 5%, cholo at 2%, black at 1%, other at 1%, while 3% were unspecified; 44% attributed themselves to some indigenous group, predominantly the linguistic categories of Quechuas or Aymaras. Whites comprised about 14% of the population in 2006, and are usually concentrated in the largest cities: La Paz, Santa Cruz de la Sierra and Cochabamba, but as well in some minor cities like Tarija. In the Santa Cruz Department, there are several dozen colonies of German-speaking Mennonites from Russia totaling around 40,000 inhabitants (as of 2012). According to the 2001 census conducted by the National Institute of Statistics of Bolivia, 78 percent of the population is Roman Catholic, followed by 19 percent Protestant and 3 percent non-religious. 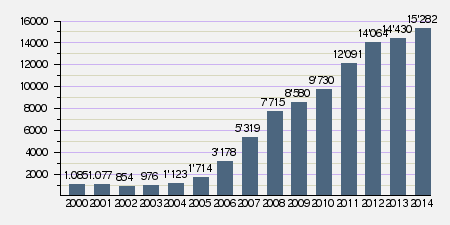 The Association of Religion Data Archives (relying on the World Christian Database) records that in 2010, 92.5 percent of Bolivians identified as Christian (of any denomination), 3.1 percent identified with indigenous religion, 2.2 percent identified as Bahá'í, 1.9 percent identified as agnostic, and all other groups constituted 0.1 percent or less. Approximately 67 percent of Bolivians live in urban areas, among the lowest proportion in South America. Nevertheless, the rate of urbanization is growing steadily, at around 2.5 percent annually. According to the 2012 census, there are total of 3,158,691 households in Bolivia – an increase of 887,960 from 2001. In 2009, 75.4 percent of homes were classified as a house, hut, or Pahuichi; 3.3 percent were apartments; 21.1 percent were rental residences; and 0.1 percent were mobile homes. Most of the country's largest cities are located in the highlands of the west and central regions. The 2011 Caroline Alethia novel Plant Teacher takes place in Bolivia from 2007 to 2008. The novel explores such themes as politics, indigenous religions, and narcotourism. The 2017 video game Ghost Recon Wildlands is set in a narco-state Bolivia. Between 2006 and 2016, extreme poverty in Bolivia fell from 38.2 percent to 16.8 percent. Chronic malnutrition in children under five years of age also went down by 14 percent and the child mortality rate was reduced by more than 50 percent, according to World Health Organization. Football (Spanish: Fútbol) is widespread. The national team is the Bolivia national football team. ^ "Moneda de 10 Centavos" (in Spanish). Central Bank of Bolivia. Archived from the original on 28 April 2007. https://web.archive.org/web/20070428004356/http://www.bcb.gov.bo/sitio/monedas/ligera/monedas/m10c.html. Retrieved 28 January 2014. ^ a b "Justia Bolivia :: Nueva Constitución Política Del Estado > PRIMERA PARTE > TÍTULO I > CAPÍTULO PRIMERO :: Ley de Bolivia". http://bolivia.justia.com/nacionales/nueva-constitucion-politica-del-estado/primera-parte/titulo-i/capitulo-primero/. ^ a b c d "South America :: Bolivia". The World Factbook. Central Intelligence Agency. https://www.cia.gov/library/publications/the-world-factbook/geos/bl.html. Retrieved 25 March 2017. ^ . Population of Bolivia (Plurinational State of) 2018. ^ a b c "Report for Selected Countries and Subjects". International Monetary Fund. https://www.imf.org/external/pubs/ft/weo/2017/02/weodata/weorept.aspx?pr.x=39&pr.y=11&sy=2015&ey=2022&scsm=1&ssd=1&sort=country&ds=.&br=1&c=218&s=NGDPD%2CPPPGDP%2CNGDPDPC%2CPPPPC&grp=0&a=. ^ "Gini index". World Bank. https://data.worldbank.org/indicator/SI.POV.GINI?locations=BO. Retrieved 5 December 2017. ^ "Bolivia (Plurinational State of)". Who.int. 11 May 2010. http://www.who.int/countries/bol/en/. Retrieved 30 August 2010. ^ "Bolivia (Plurinational State of)". UNdata. http://data.un.org/CountryProfile.aspx?crName=Bolivia%20(Plurinational%20State%20of). Retrieved 30 August 2010. ^ International Monetary Fund (October 2016). "List of South American countries by GDP per capita". World Economic Outlook. International Monetary Fund. http://statisticstimes.com/economy/south-american-countries-by-gdp-per-capita.php. ^ TELESUR (2 January 2018). "Bolivia Pegged As Leader In Economic Growth in Latin America for 2017". TELESUR. TELESUR. https://www.telesurtv.net/english/news/Bolivia-Pegged-As-Leader-In-Economic-Growth-in-Latin-America-for-2017-20180102-0019.html. ^ "En la última década Bolivia redujo la pobreza en un 21%". El Deber. 30 November 2011. Archived from the original on 5 December 2011. https://web.archive.org/web/20111205032039/http://www.eldeber.com.bo/2011/2011-11-30/vernotaahora.php?id=111129221401. Retrieved 30 November 2011. ^ "Bolivia 'One of Three Safest Countries in Latin America'". telesurtv.net. Archived from the original on 18 February 2018. https://www.telesurtv.net/english/news/Bolivia-One-of-Three-Safest-Countries-in-Latin-America-20180126-0025.html. Retrieved 16 February 2018. ^ "Simón Bolívar". Salem Press. Archived from the original on 25 August 2013. https://web.archive.org/web/20130825121538/https://salempress.com/store/samples/great_lives_from_history_19th/great_lives_from_history_19th_bolivar.htm. Retrieved 28 January 2014. ^ "6 de Agosto: Independencia de Bolivia". Historia-bolivia.com. Archived from the original on 20 August 2011. https://web.archive.org/web/20110820091233/http://historia-bolivia.com/6-de-Agosto-Independencia-de-Bolivia/6. Retrieved 14 July 2013. ^ "What countries are named after individuals or families?". Blogs.law.harvard.edu. 11 January 2009. http://blogs.law.harvard.edu/philg/2009/01/11/what-countries-are-named-after-individuals-or-families/. Retrieved 14 July 2013. ^ Caistor, Nick (10 June 2010). "Can Bolivia's indigenous groups dance in harmony?". BBC News. http://news.bbc.co.uk/1/hi/programmes/from_our_own_correspondent/8729971.stm. Retrieved 14 July 2013. ^ a b McAndrews, Timothy L. (1997). "Regional Settlement Patterns in the Tiwanaku Valley of Bolivia". Journal of Field Archaeology 24 (1): 67–83. DOI:10.2307/530562. ^ Isbell, William H. (2008). "Wari and Tiwanaku: International Identities in the Central Andean Middle Horizon". The Handbook of South American Archaeology: 731–751. DOI:10.1007/978-0-387-74907-5_37. ^ Demos, John. "The High Place: Potosi". Common-place.org. Archived from the original on 26 December 2012. https://www.webcitation.org/6DCjAsiyH?url=http://www.common-place.org/vol-03/no-04/potosi/. Retrieved 14 July 2013. ^ "Conquest in the Americas". MSN Encarta. 28 October 2009. Archived from the original on 28 October 2009. https://web.archive.org/web/20091028035130/http://encarta.msn.com/encyclopedia_761575057_13/Spain.html. Retrieved 14 July 2013. ^ "Bolivia – Ethnic Groups". Countrystudies.us. http://countrystudies.us/bolivia/29.htm. Retrieved 30 August 2010. ^ Robins, Nicholas A.; Jones, Adam (2009). Genocides by the Oppressed: Subaltern Genocide in Theory and Practice. Indiana University Press. pp. 1–2. ISBN 978-0-253-22077-6. https://books.google.com/books?id=AX3UCk_PdEwC. ^ "Rebellions". History Department, Duke University. 22 February 1999. Archived from the original on 31 January 2012. https://web.archive.org/web/20120131062804/http://www.duke.edu/~ems19/rebellions/rebellions.html. Retrieved 14 July 2013. ^ McGurn Centellas, Katherine (June 2008). For Love of Land and Laboratory: Nation-building and Bioscience in Bolivia. Chicago. ISBN 9780549565697. https://books.google.com/books?id=VXD4SlJQYDgC&pg=PA97. ^ Rabanus, David. "Background note: Bolivia.". Bolivien-liest.de. http://www.bolivien-liest.de/en/country_en.html. Retrieved 14 July 2013. ^ History World (2004). "History of Bolivia". National Grid for Learning. http://www.historyworld.net/wrldhis/PlainTextHistories.asp?historyid=ac11. ^ Grant, Will (8 October 2007). "CIA man recounts Che Guevara's death". BBC News. Retrieved on 2 January 2010. ^ (13 October 1967) "Statements by Ernesto "Che" Guevara Prior to His Execution in Bolivia". Foreign Relations of the United States, Volume XXXI, South and Central America; Mexico. XXXI: 172. ^ Boyd, Brian (20 January 2006). "Astroturfing all the way to No 1". The Irish Times. http://www.irishtimes.com/theticket/articles/2006/0120/1137626790492.html. Retrieved 7 April 2010. ^ Sims, Calvin (1995-07-01). "INTERNATIONAL BUSINESS; Bolivia Sells Utility to U.S. Companies". The New York Times. ISSN 0362-4331. https://www.nytimes.com/1995/07/01/business/international-business-bolivia-sells-utility-to-us-companies.html. ^ Ewing, Andrew (1994). "Privatization by Capitalization : The Case of Bolivia – A Popular Participation Recipe for Cash-Starved SOEs". Viewpoint. ^ "1994 CIA World FactBook". http://www.umsl.edu/services/govdocs/wofact94/wf950032.txt. Retrieved 4 March 2010. ^ "Historia de la República de Bolivia". http://www.mirabolivia.com/edu/historia.htm. Retrieved 4 March 2010. ^ Kohl, Benjamin (2003). "Restructuring Citizenship in Bolivia: El Plan de Todos". International Journal of Urban and Regional Research 27 (2). DOI:10.1111/1468-2427.00451. ^ "Ethnicity and Politics in Bolivia" (PDF). Ethnopolitics 4(3):269–297. September 2005. http://chakana.nl/files/pub/AssiesSalman_2005_Ethnicity-and-Politics-in-Bolivia.pdf. Retrieved 14 July 2013. ^ Lucero, José Antonio (2009). "Decades Lost and Won: The Articulations of Indigenous Movements and Multicultural Neoliberalism in the Andes". In John Burdick. Beyond neoliberalism in Latin America?. Palgrave Macmillan. ISBN 978-0-230-61179-5. ^ "Push for new Bolivia constitution". BBC News. 6 August 2006. http://news.bbc.co.uk/2/hi/americas/5251306.stm. Retrieved 30 August 2010. ^ "Country Comparison :: Area". The World Factbook. Central Intelligence Agency. https://www.cia.gov/library/publications/the-world-factbook/rankorder/2147rank.html. Retrieved 12 February 2014. ^ "Lake Titicaca". UNESCO. 17 June 2005. http://whc.unesco.org/en/tentativelists/5080/. Retrieved 12 February 2014. ^ Karger, Dirk Nikolaus (2016-07-01). "Climatologies at high resolution for the Earth land surface areas". Scientific Data 4 (170122): 170122. DOI:10.1038/sdata.2017.122. ^ "Fortalecimiento de las Capacidades locales para enfrentar El Fenómeno del Niño en Perú y Bolivia" (PDF). itdg.org.pe. Archived from the original on 8 March 2005. https://web.archive.org/web/20050308110026/http://www.itdg.org.pe/archivos/desastres/reportemarzo.pdf. Retrieved 14 July 2013. ^ "Deja 56 muertos "El Niño" en Bolivia". elfinanciero.com.mx. Archived from the original on 27 September 2007. https://web.archive.org/web/20070927001813/http://www.elfinanciero.com.mx/ElFinanciero/Portal/cfpages/contentmgr.cfm?docId=48449&docTipo=1&orderby=docid&sortby=ASC. Retrieved 14 July 2013. ^ "LIKE MINDED MEGADIVERSE COUNTRIES". http://pe.biosafetyclearinghouse.net/actividades/2009/grouplmmc.pdf. Retrieved 6 January 2014. ^ "Bolivia es el Sexto País con la Mayor Cantidad de Especies de Aves en el Mundo" (in Spanish). Bolivia.com. 10 June 2009. http://www.bolivia.com/noticias/Autonoticias/DetalleNoticia40938.asp. Retrieved 21 February 2014. ^ Solon, Olivia (11 April 2011). "Bolivia Grants Nature Same Rights as Humans". Wired. Archived from the original on 12 December 2013. https://web.archive.org/web/20131212174326/http://www.wired.co.uk/news/archive/2011-04/11/bolivia-law-of-mother-nature. Retrieved 12 February 2014. ^ a b "Political Constitution of the State, First Part, Title I, Chapter One: Model of State" (PDF). Nueva Constitución Política del Estado. p. 4. Archived from the original on 19 June 2009. https://web.archive.org/web/20090619201729/http://www.presidencia.gob.bo/download/constitucion.pdf. Retrieved 14 July 2013. "I. Sucre is the Capital of Bolivia."" ^ "Posesionan a cuatro Vocales del Tribunal Supremo Electoral". La Jornada. 16 August 2010. http://www.jornadanet.com/n.php?a=51574-1. Retrieved 28 April 2011. ^ "Bolivia". Oas.org. http://www.oas.org/columbus/Bolivia.asp. Retrieved 14 July 2013. ^ "Satellite view in Wikimapia of Bolivia Mar, near the Peruvian town of Ilo". Wikimapia. http://www.wikimapia.org/#lat=-17.739531&lon=-71.258011&z=14&l=3&m=a&v=2. Retrieved 25 October 2014. ^ "Bolivia Military Profile 2006". Index Mundi. 2006. http://indexmundi.com/bolivia/military_profile.html. ^ Carroll, Rory (28 August 2008). "Bolivia's landlocked sailors pine for the high seas". The Guardian (London). https://www.theguardian.com/world/2008/aug/28/bolivia. Retrieved 26 April 2010. ^ "Country Rankings". 2013 Index of Economic Freedom. Heritage.org. http://www.heritage.org/index/Ranking.aspx. Retrieved 30 August 2010. ^ Weisbrot, Mark; Ray, Rebecca & Johnston, Jake (December 2009). "Bolivia: The Economy During the Morales Administration". CEPR – Center for Economic and Policy Research. http://www.cepr.net/index.php/publications/reports/bolivian-economy-during-morales-administration/. ^ Crabtree, J. (1988). "The Great Tin Crash: Bolivia and the World Tin Market". Bulletin of Latin American Research 7 (1): 174–175. DOI:10.2307/3338459. ^ "Economy of Bolivia". US State Government. 23 October 2012. https://www.state.gov/r/pa/ei/bgn/35751.htm#econ. Retrieved 14 July 2013. ^ Hattam, Jennifer (September 2001). "Who Owns Water?". Sierra 86 (5). Retrieved on 14 July 2013. ^ "Leasing the Rain". PBS Frontline/World. June 2002. https://www.pbs.org/frontlineworld/stories/bolivia/. Retrieved 14 July 2013. ^ "Anti-Morales protests hit Bolivia". BBC News. 10 September 2008. http://news.bbc.co.uk/2/hi/americas/7607158.stm. Retrieved 30 August 2010. ^ "Bolivia's lithium mining dilemma". BBC News. 10 September 2008. http://news.bbc.co.uk/1/hi/business/7607624.stm. Retrieved 26 April 2010. ^ BCB (19 January 2015). 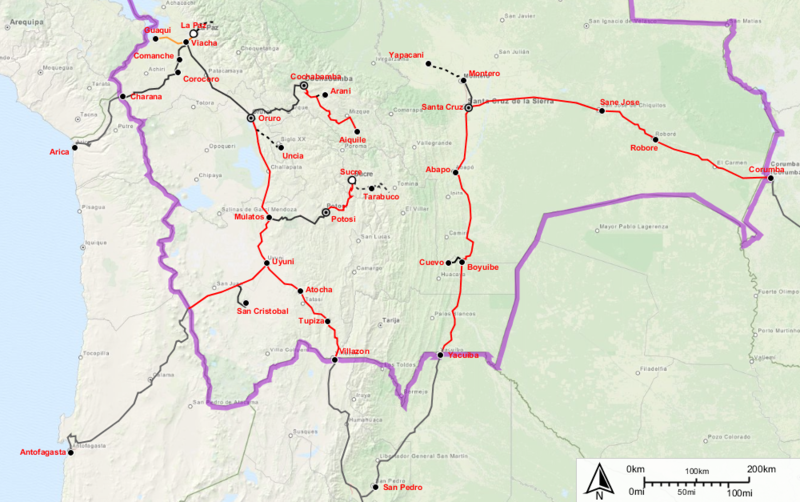 "Bolivia: Reservas Internacionales del BCB al 15 de Enero del 2015". https://www.bcb.gob.bo/webdocs/ReservasInternacionales/graficas/RIN_PAGWEB15ene15.pdf. ^ "Amaszonas". Amaszonas. http://www.amaszonas.com. Retrieved 30 August 2010. ^ "Nearly Forgotten - Nuclear Power in Latin America - BERC". 5 November 2014. http://berc.berkeley.edu/nearly-forgotten-nuclear-power-in-latin-america/. ^ Paz, AFP in La; Bolivia (29 October 2015). "Bolivia plans to build $300m nuclear complex with research reactor". https://www.theguardian.com/world/2015/oct/29/bolivia-nuclear-complex-reactor-russia-environment. ^ JMP 2010 Estimates for Bolivia Script error. The estimates are based on the Household Survey (2005), the Bolivia Democratic and Health Survey (2008) and other surveys. ^ "Principales resultados del censo nacional de población y vivienda 2012 (CNPV 2012) – Estado plurinacional de Bolivia". Instituto Nacional de Estadística (INE). July 2013. Archived from the original on 9 February 2014. https://web.archive.org/web/20140209134921/http://www.ine.gob.bo:8081/censo2012/PDF/resultadosCPV2012.pdf. Retrieved 8 August 2013. ^ (2013) "Ancestry analysis reveals a predominant Native American component with moderate European admixture in Bolivians". Forensic Science International: Genetics 7 (5): 537. DOI:10.1016/j.fsigen.2013.05.012. ^ "Bolivian Reforms Raise Anxiety on Mennonite Frontier". New York Times. 21 December 2006. https://www.nytimes.com/2006/12/21/world/americas/21bolivia.html?_r=1&oref=slogin. Retrieved 14 July 2013. ^ "ボリビア多民族国（The Plurinational State of Bolivia）". http://www.mofa.go.jp/mofaj/area/bolivia/data.html. ^ "Geographical Distribution of the Lebanese Diaspora". The Identity Chef. http://theidentitychef.com/2009/09/06/lebanese-diaspora-worldwide-geographical-distribution/. ^ "Bolivia religion". USA: Department of State. 14 September 2007. https://www.state.gov/g/drl/rls/irf/2007/90243.htm. Retrieved 30 August 2010. ^ "Ateos en números". InterGlobal. Archived from the original on 5 December 2014. https://web.archive.org/web/20141205041006/http://institutointerglobal.org/ateismo/1545-ateos-en-numeros. ^ "Pachamama y los Dioses Incaicos". Catamarcaguia.com.ar. Archived from the original on 17 January 2013. https://web.archive.org/web/20130117013359/http://www.catamarcaguia.com.ar/Cultura/Pachamama.php. Retrieved 14 July 2013. ^ "El Tata Santiago, un santo en Guaqui con vena de general". Bolivia.com. http://www.bolivia.com/Noticias/AutoNoticias/DetalleNoticia32134.asp. ^ a b c "Country Comparison :: Life Expectancy at Birth". The World Factbook. Central Intelligence Agency. https://www.cia.gov/library/publications/the-world-factbook/rankorder/2102rank.html?countryname=Bolivia&countrycode=bl&regionCode=soa&rank=161#bl. Retrieved 11 February 2014. ^ "Bolivia: Hogares por Tipo y Tenencia de la Vivienda, Según Área Geográfica, 2000 – 2009". National Institute of Statistics of Bolivia. Archived from the original on 13 November 2013. https://web.archive.org/web/20131113183010/http://www.ine.gob.bo/indicadoresddhh/vivi4.asp. Retrieved 28 January 2014. ^ a b c "Background Note: Bolivia". United States Department of State. https://www.state.gov/r/pa/ei/bgn/35751.htm. Retrieved 17 October 2006. ^ "Bolivia Declares Literacy Success". BBC News. 21 December 2008. http://news.bbc.co.uk/2/hi/americas/7794293.stm. Retrieved 12 February 2014. ^ cg-RSF-rg, teleSUR /. "Bolivia 1st in Education Investment in South America: Report". https://www.telesurtv.net/english/news/Bolivia-1st-in-Education-Investment-in-South-America-Report-20171024-0018.html. ^ "Amnesty International Report 2007 – Bolivia". Amnesty International. 23 May 2007. http://www.refworld.org/cgi-bin/texis/vtx/rwmain?page=publisher&publisher=AMNESTY&type=&coi=BOL&docid=46558ec011&skip=0. Retrieved 12 February 2014. ^ "Bolivia (Estado Plurinacional)" (in Spanish). World Health Organization. May 2013. pp. 1–2. Archived from the original on 12 December 2013. https://web.archive.org/web/20131212111313/https://www.who.int/countryfocus/cooperation_strategy/ccsbrief_bol_en.pdf. Retrieved 12 February 2014. ^ "Bolivia". Demographic and Health Surveys. http://www.measuredhs.com/Where-We-Work/Country-Main.cfm?ctry_id=2. Retrieved 12 February 2014. ^ uj-MS-rg, teleSUR /. "WHO Exalts Bolivia’s Advances in Healthcare". https://www.telesurtv.net/english/news/WHO-Exalts-Bolivias-Advances-in-Healthcare-20171024-0026.html. Constitute Assembly of Bolivia (2007). "Nueva Constitucion Politica del Estatdo" (in Spanish) (PDF). Government of Bolivia. Archived from the original on 3 March 2009. https://web.archive.org/web/20090303221158/http://www.presidencia.gob.bo/asamblea/nueva_cpe_aprobada_en_grande_en_detalle_y_en_revision.pdf. Retrieved 28 January 2014.